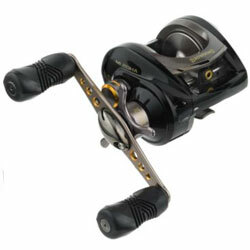 For the accomplished sportsman in search of that ''golden touch'' on the water, a reel worthy of the quest. Beneath the rich gunsmoke metallic finish lurks a reel loaded with premium features and ranked near the top in every performance category. Its powerful 1-piece aluminum frame, double-anodized forged aluminum spool and stamped aluminum handle keep the weight down and strength up; inside are 9 double-shielded stainless steel bearings, plus the PowerLock instant anti-reverse roller bearing. "This reel is not a good reel. It will spool up uneven and the brake system has not lasted. The magnetit brake system is cheap and compoared to similar priced reels it isn't worth it." "I got this reel to use as a crankbait/swim bait rig. After tuning it and trying different lure weights I quickly realized this was no ordinary reel. I'm finding an infinite number of adjustment combinations between the reel friction knob and the magnetic/brake knobs." "I originally purchased 1 reel. Now I have 4 and have sold two friends on them as well. If that doesn't say enough my father -in-law was affraid to even look @ baitcasters until I convinced him to try this one." "Bought one of these on vacation in the St. Louis store this summer. Found the reel to be a solid performer. It does have its quirks and limitations."